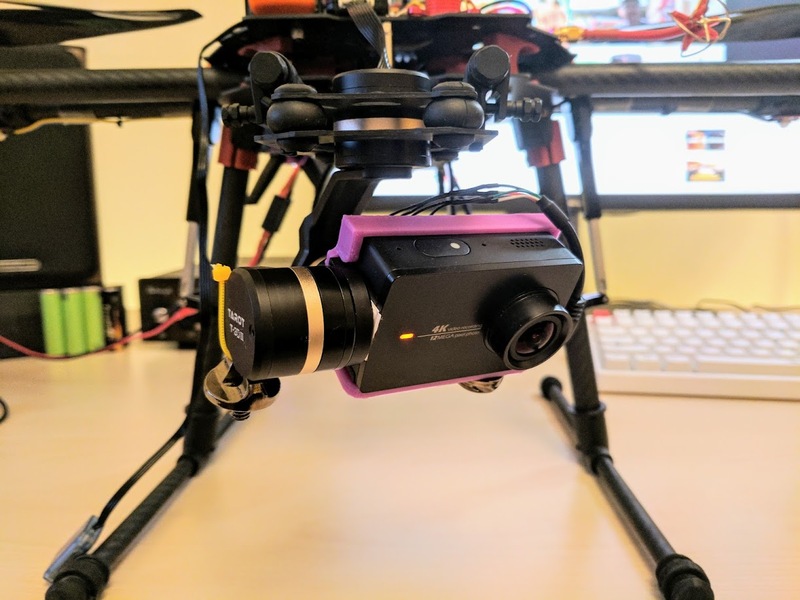 I bought a Tarot TL3T01 gimbal, which is designed for GoPro 3/4 (42mm tall), under the impression that a Xiaomi Yi 2 4k (also 42mm tall) would fit. 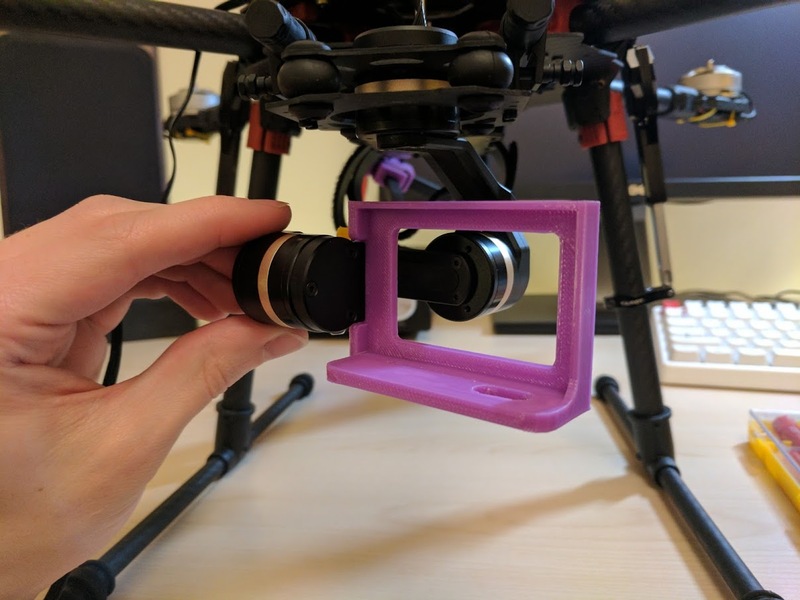 Turns out that Xiaomi millimetres are bigger than GoPro millimetres so it didn’t fit… I found a video on YouTube from a guy that had 3D printed an adapter which I modified slightly so that it fit better. The micro USB AV out cable for an SJCAM has the same pinout on the USB end as the Yi 2 4k, so I spliced that with the gimbal cable. The gimbal controller doesn’t provide enough power to run the Yi 2 4k without its battery, but it does charge the battery a bit when its in. 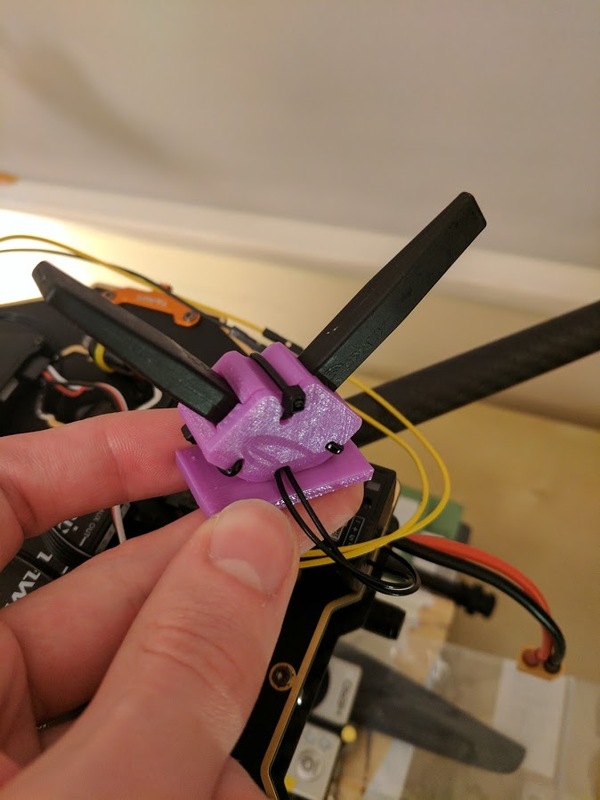 Whilst I was at it, I also 3D printed a mount for the X8R antennas – find it here on Thingiverse. I also added a cheap 2-channel video switcher that is controlled direct from one of the servo outputs on the X8R. I did try to control it via the Pixhawk, but it seems that arducopter doesn’t really have the notion of RC passthrough so it was much less hassle to control it direct from the receiver. 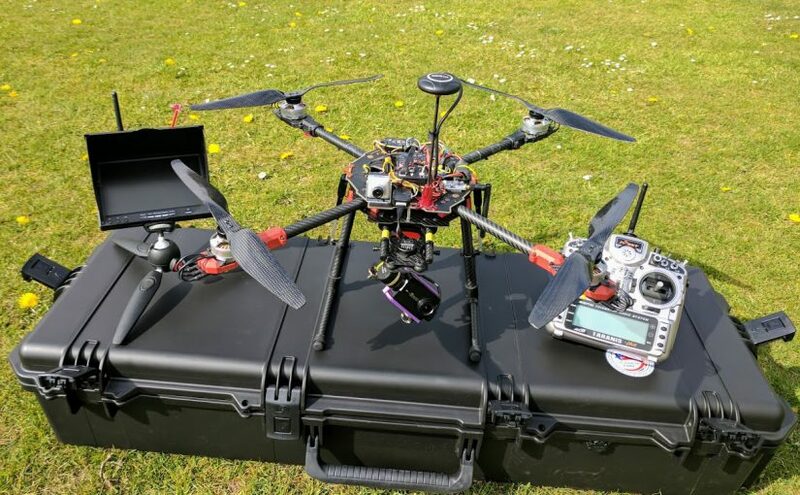 Unlike the landing gear, which the flight controller has to be able to control in case of a failsafe situation, there isn’t any reason why it would need to control the video switcher so connecting it straight to the receiver doesn’t pose any problems. 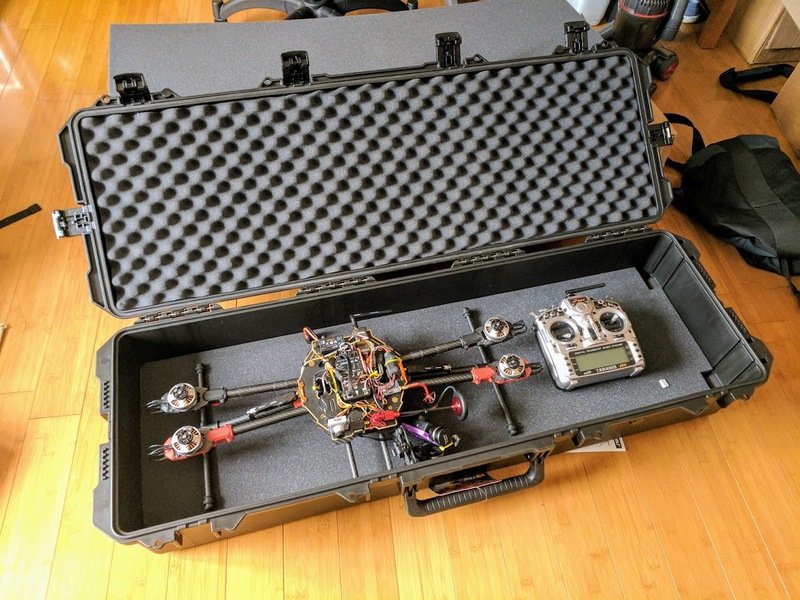 VTX is a FX799T, they’ve been serving me well for a long time now. 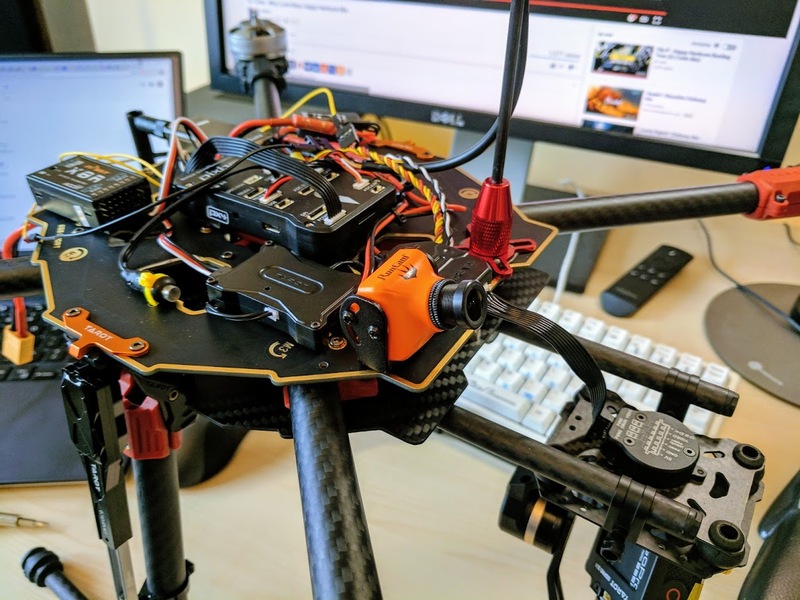 I picked up a cable/adapter from Craft & Theory to let me get telemetry on my Taranis via the X8R’s smartport, using the free luapilot script on the Taranis itself. I have the 433MHZ SiK radios for MAVLink when I have a smartphone/tablet/laptop, but it’s nice to have the familiar Taranis telemetry as a fallback or for when I don’t want to have another device setup. The FrSky telemetry also has virtually no lag compared to the 433MHz link. 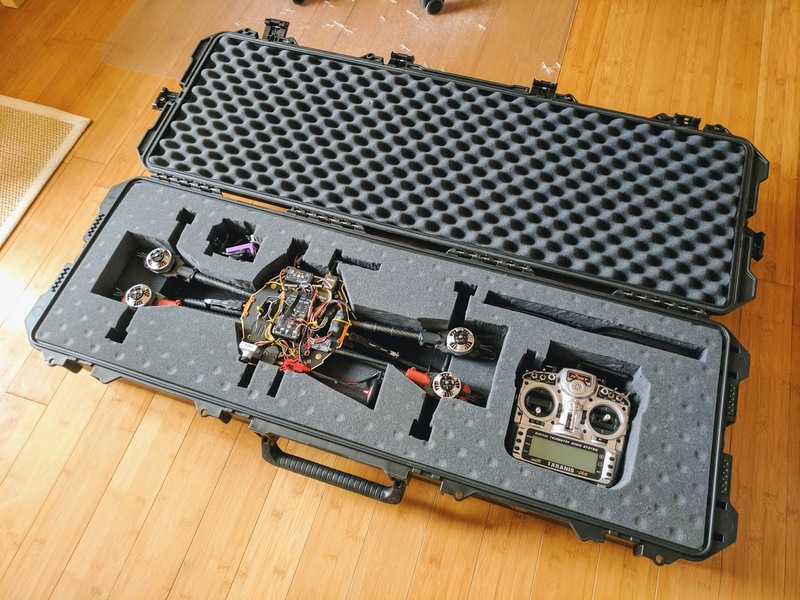 I’m taking this ‘copter with me to Pakistan in a few days, so a decent hard case was a(n expensive) necessity for it to travel as checked baggage. I ended up getting the Peli Storm IM3220 which is bigger than I was originally hoping for, but should offer good protection. The other case I was looking at was the Peli 1650 which is a squarer case that would have had the quad on one level & the radio etc. on another. I decided a single layer in a longer but shallower case was better, as I didn’t want to have to remove a layer of foam & then try to find somewhere to put it down where it wouldn’t get covered in sand/dirt/etc. First time cutting foam like this, didn’t have a hot knife but I reckon it turned out okay. I put a layer of masking tape over the top surface, drew around the items with a Sharpie, cut through the tape about ~5mm deep, then removed the tape & continued the cuts all the way through. 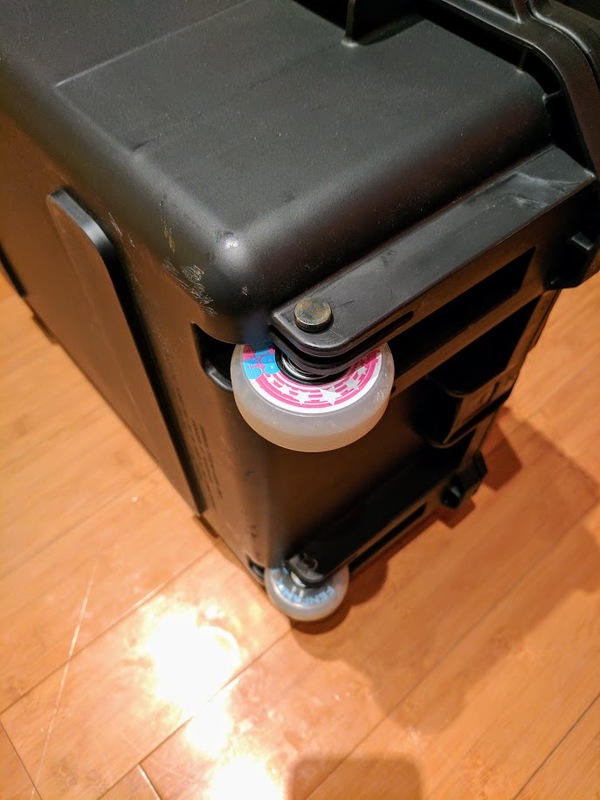 I replaced the stock wheels with some pretty FENFANIX blade wheels that I bought years ago for my Peli 1510 but which didn’t actually fit the 1510 (they’re too thick). The stock wheels on the 1510 were far too hard, the IM3220 ones were actually okay but these replacements are definitely a softer ride. Then it was time to test the RC failsafe behaviour – intentionally turning the radio off to check that it behaves sensibly in the event of losing signal in a real life situation & flies back to the launch location using GPS, lowers the landing gear & lands, instead of flying off into the sunset or falling out of the sky! The quick release prop adapters you can see in the video & some of the later photos are the STO (Standard Tech Operation) ones, which I bought from Professional Multirotors in Estonia as the only other stockist I could find was Infinity Hobby in Japan who were closed for a warehouse move. These aren’t a self-tightening design, which I don’t trust at all on big props as they have enough weight behind them that motor braking or wind can potentially unscrew them. Instead these ones have two flanges on the motor half that lock into cutouts on the prop half & the halves them screw together with a rubber washer between.